When I posted an event to meet up with other women for brunch on Facebook, I did not know what to expect. Would anyone be interested? Would someone join me? I have made some female friends since moving to Reno three years ago but they all have their own families. Encroaching on their lives is the last thing I want to do. So meeting other women and having casual conversations over food just sounded like fun! Especially if I can ride my bike to the restaurant and the attendees who could meet me there would also do the same!! It all became a reality yesterday when I sat down with four other women (three I have never met or met once) at Brewer's Cabinet and got to know a little bit about them. My husband rode with me from home and would split off after the restaurant to train on his own. I was grateful to have him to duck behind for shelter from the wind because it was NOT a nice spring morning at all. Even though it was sunny, it was 50F degrees cold with gusty winds. 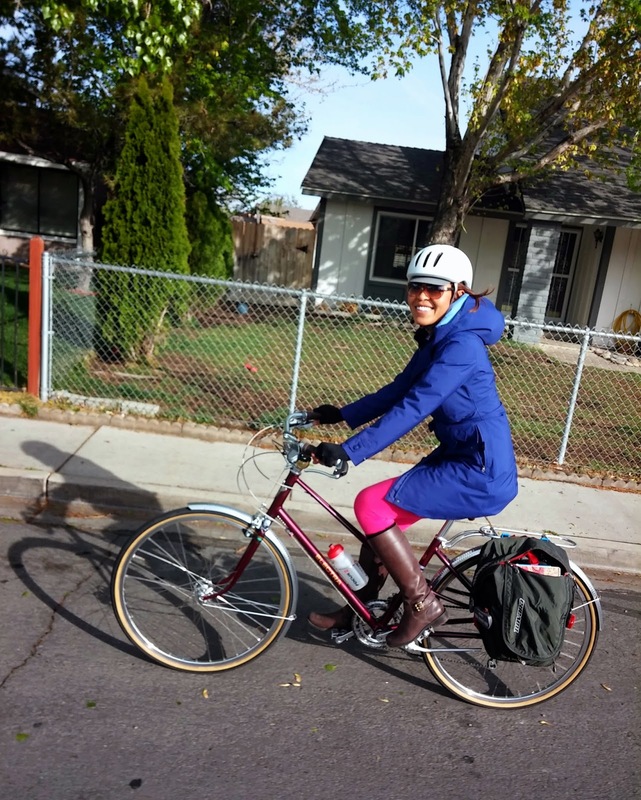 Despite the less-than-optimal weather, I insisted on biking although I would not have blamed other women if they drove instead. One by one the ladies rolled up on their bicycles to our meetup place. Krystine, then Kara and Rachel, and Sarah. Since we were the first ones there, we had our choice of seating. The blustery winds were calmer at the restaurant so we sat outside for some fresh air. I am glad we did because the inside seating filled up soon thereafter because no one else wanted to sit outside (and it would have been too loud for a group conversation inside anyway). At least we wouldn't feel rushed to give up our seats. Breakfast was good although food tends to get cold quick when it is sitting in a virtual refrigerator LOL. I had the Vegetable Omelet. At our table, we have a Biochemistry student and Secretary of the UNR Campus Cycling Coalition, a (structural?) Engineer and two dedicated volunteers for the Reno Bike Project, a PeopleSoft EPM Admin and a PeopleSoft Business Analyst who is also a Board Member of the Reno Bike Project. We talked about farmer's market and food storage containers. It was more than that, actually but ... well, you would have to be there next time to find out!! After brunch, some of the women rode to the Earth Day celebration at Idlewild Park. I felt so bad I had to pass on the event because I needed to help my husband track down my cell phone that had dropped out of the inside breast pocket of my jacket somewhere along the 8.78 mile route to brunch! Fortunately we found it, thanks to Google+ location sharing!! Google+ Location offers a piece of mind to my husband and I so we would know each other's whereabouts when bicycle commuting between work and home or when he is on a training ride--just in case one of us needs assistance. It sure came in handy that day and saved me from having to buy another smart phone. There so much cycling stuff I would rather splurge on than needing to replace a gadget LOL!! So MARK YOUR CALENDAR for the next Women's Bike to Brunch Ride!! RSVP on Facebook: https://www.facebook.com/events/1419636114966140/ and bring a friend or two whether or not she rides a bike!! She can still share in the joy of cycling!! Ride all the way or drive and ride. It doesn't matter what bike you have or what you wear. Just come and join the conversation and have fun! !